"...the main delight of this book is its social context: it was written at a time when the ghastly Ceaușescus were in power and the state controlled everything. Arion’s book is a brilliantly ironic satire on this system." 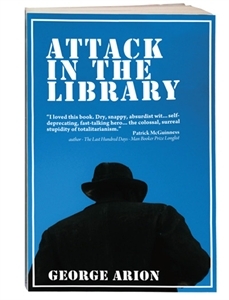 "I first met Attack in the Library in the original when I was a teenager, and now I discovered it translated in English. It feels as fresh as the original, and it is only now in reading it again that I appreciate fully its importance as a crime novel of the best kind." "I discovered a truly amazing book, funny and dead serious in the same time. George Arion produced an intriguing novel, a “whodunnit” overshadowed by danger throughout but illuminated by sparkling, unstoppable humour. " "A surprise discovery from behind the Iron Curtain [...] this is a brilliant translation."